Though Asaram Bapu is an old man aged 72 with a white beard, after 8pm he wants to play with girls. He can’t sleep if he doesn’t have that fun. He has used so many women in his bedroom, so says his disciple Siva who spoke those truths to police. Meanwhile, attacks and murder by Asaram goondas continue – complicated by threats, bribery, and every kind of trickery and shenanigans – making the legal process tortuous- This specimen of inhumanity, Asaram Bapu, should have been locked up and the keys thrown away long since. 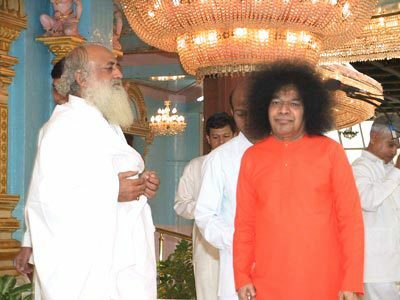 IT IS WELL KNOWN THAT ASARAM BAPU WAS CELEBRATED AS A GUEST BY SATHYA SAI BABA AT PRASHANTHI NILAYAM, IN SHORT, BIRDS OF A FEATHER SEXUAL ABUSERS FLEW TOGETHER! This entry was posted on June 16, 2014 at 5:17 am	and is filed under Sathya Sai Baba. You can follow any responses to this entry through the RSS 2.0 feed. You can leave a response, or trackback from your own site.